As part of the “Cultural Heritage Disaster Risk Mitigation Network Promotion Project” (commissioned by the Agency for Cultural Affairs), the Department of Intangible Cultural Heritage and the Department of Art Research, Archives and Information Systems have been working on the “Project to Collect, Organize and Share Cultural Properties Designated by the Local Governments.” The Department of Intangible Cultural Heritage is now compiling a database of intangible cultural heritage information collected throughout Japan while establishing archives of its related data as one of its missions. 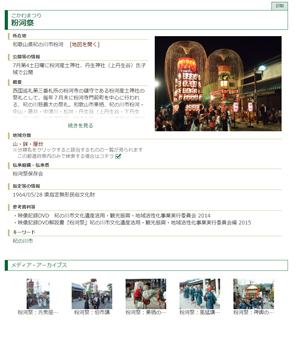 We have already published our “Intangible Cultural Heritage Archives” subject to Wakayama Prefecture as its pilot version (http://mukeinet.tobunken.go.jp/group.php?gid=10027). You can learn the name of each intangible cultural property, its place of publication and overview, as well as view its photos and videos, by searching it with a map, classification, date of performance and keyword. We have disclosed the information and images on intangible cultural properties located in Wakayama Prefecture, which were collected thanks to the Wakayama Prefectural Board of Education. 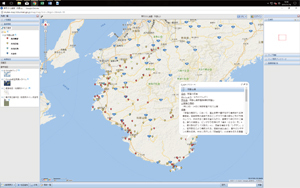 We will expand the same data collection and publication to all prefectures while accumulating and disclosing related records as much as possible. 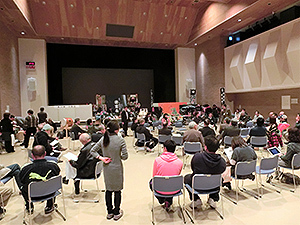 On November 13th, 2016, an event titled “Inheritance and Development of Cultural Heritage – Event to Support the Restoration of Local Performing Arts – Let’s talk and pass down together” was organized by the National Museum of Ethnology and held in the main hall of the Ofunato Municipal Sanriku Community Center. Disaster-stricken performing arts groups, supporters, administrative authorities, and researchers got together and exchanged views and opinions concerning the path that they have taken thus far, proactive measures, and know-how on receiving support and keeping equipment, tools and costumes safe. The Department of Intangible Cultural Heritage (DICH) exhibited posters for the “311 Reconstruction Support and Intangible Cultural Heritage Information Network” that it has operated with more than one collaborative body since the Great East Japan Earthquake and Tsunami and for the protection of intangible cultural properties from disaster. While support has been diminishing, disaster-affected performing arts groups continue to face harsh circumstances. Few events that bridge these performing arts groups, supporters, administrative authorities, and researchers have been held to discuss the actual situation surrounding the devastated performing arts or issues associated with support on site and on a face-to-face basis. Continuously having opportunities to form “loose networks” such as this may lead to the ideal form of protection from disaster for intangible cultural heritages both now and in the future.